Never one to rest on its cheese-covered laurels (coming soon! ), Taco Bell -- fresh off the introduction of the Quesalupa -- has begun testing another menu item, this time at select locations in North Carolina. The Bacon Quesarito functions much like the standard Quesarito (a burrito wrapped up in a quesadilla instead of a tortilla), except that there is A TON OF CRUMBLED BACON loaded into the cheesy inner quesadilla layer. 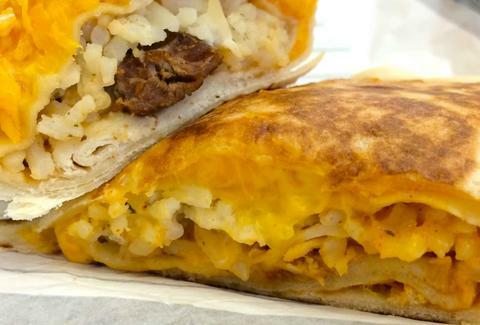 The Bacon Quesarito is available filled with all the usual Taco Bell meat suspects (shredded chicken, ground beef, or steak), and comes with sour cream, rice, and spicy chipotle sauce. Plenty of other T-Bell menu items already include bacon, but this is one of the only current straight-up non-breakfast concepts to incorporate some porky goodness. So the next time you want bacon and melted cheese -- and you don't have the ingredients for a bacon-weave mac 'n' cheese quesadilla on hand -- you might be able to walk over to your local Taco Bell. Let's just hope it makes it out of North Carolina and into our collective hands. Adam Lapetina is a Food/Drink staff writer for Thrillist, and is glad he finally has an excuse to eat more bacon outside of breakfast. Read his musings at @adamlapetina.